Cycle Law Scotland believes in actively campaigning to ensure that Scotland's roads become a safer place for vulnerable road users. Spokes is the Lothian Cycle Campaign – a non party political voluntary organisation, founded in 1977, and now with a membership of over 1000. SPOKES has a long history of effective campaigning for better conditions for cyclists, especially in Edinburgh and the Lothians. Whilst still far from European conditions or numbers, Edinburgh has seen improving onroad and offroad cycling infrastructure, and accelerating growth in cycle use – at the same time that cycle use was flat or declining in most of the UK. When Spokes began, cycle commuting was 1% of all trips. In 2011 it was 7% (+ or – 2%) according to the Scottish Household Survey. 4. Integrate cycling into local transport strategies. 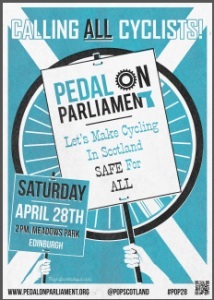 Cycle Law Scotland supports POP and attends its annual mass cycling demonstration ride (3-4000 cyclists) to Holyrood from the Meadows at the end April each year. The Go Bike campaign exists to promote cycling in the Strathclyde area of Scotland, and is active mainly within Glasgow, East Dunbartonshire, and East Renfrewshire. Cycle Law Scotland support its activities and is a member. Cycle Law Scotland is an active supporter of the National 20s Plenty Group. Along with the introduction of presumed liability, it is the other key change which could dramatically reduce the number of killed and seriously injured cyclists and pedestrians on Britain's roads. Edinburgh will shortly be implementing 20mph restrictions on all roads within the city other than the main arterial routes. Glasgow is pushing to have the same and there is a wider push for the Scottish Government to support this as the default speed limit which will greatly increase speed of change and implmentation for Local Authorities. They would then have the ability to increase speed on main routes where they see fit. 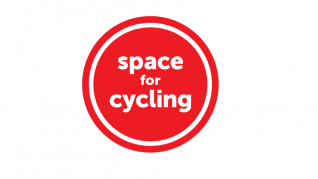 CTC's national Space for Cycling campaign aims to create the conditions where anyone can cycle anywhere. Cycle-friendly streets are the life-blood of safe, pleasant and healthy communities. They are good for everybody's quality of life, whether or not they chose to cycle. You can help create Space for Cycling by calling on your Councillors to pledge their support for high standards of cycle-friendly planning and design, and the funding needed to deliver this. Cycling needs to become a safe, convenient and enjoyable option for people of all ages and backgrounds, for any local journey. Give Everyone Cycle Space is a Cycling Scotland campaign to encourage more people to cycle. It aims to create high levels of driver awareness around people on bikes to make Scotland’s roads more cycle friendly. Rule 163 of the Highway code states that drivers should give vulnerable road users as much space as they would a car when passing.